I hung up the phone, my heart breaking for Pam, her husband Russ, and good, old Luke. I sat quietly for awhile and reminised about the good times that we had with Luke, their other two dogs, and the stories of how they came into our lives. Fly, otherwise known as “Fiffy,” was the cutest little black-and-white border collie puppy. 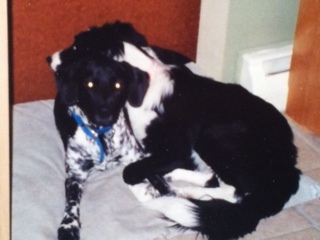 As a puppy, Fly was diagnosed with hip dysplasia in both hips. Her owners were unable to care for her, so they relinquished her to me. A fundrasier was organized and enough money was raised for Fly to have the surgery on her hips that she needed. In the meantime, knowing Pam and Russ where looking for a companion for Luke, I asked if they would be interested in adopting her. They couldn’t have been more willing. Luke, now one-and-a-half years old, adored Fly. They’d both squeeze in one dog bed together to sleep. Fly was ten months old when she had her hip surgery. Once Fly had recovered, she became completely obsessed with the tennis ball and watching their cats, Jasmine, Peachy, and Leo. She also made it her job to keep Luke out of trouble. When he was up to no good, she’d distract him by nipping at his hind legs, tugging on his ears, and barking directly in his face. When all else failed, she’d find Pam, circle around her, and bark until she agreed to follow her, right to the trouble-maker, Luke. They were so fond of one other, nearly inseperable. 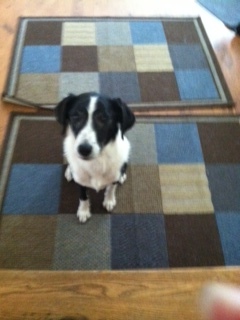 Then came Tillie, a border collie mix that I had rescued from a rural shelter located in the hills of West Virginia. I’ll never forget the day I received the email from another rescuer asking if I could help. “She’ll be put down if she doesn’t have a rescue commitment by the end of the day. I can help with the transport arrangements.” Attached to the email was a picture of the most pathetic, petritifed, tiny little black-and-white dog huddled in the corner of a dirty old kennel. How could I say no? A week later, I headed out to pick her up. I was to meet the transport in the parking lot of a particular restaurant. I packed up my truck with a crate, bowl, water, food, paper towels, leash, and collar. Concerned about traffic and not wanting to hold up the transport, I arrived early, so I went into the restaurant to relax and have a cup of coffee. As I sipped from my mug, I reviewed the paperwork that had been emailed to me with details about the little dog. It included her medical history, shelter information, and the picture that had been sent to me earlier by the shelter contact. As I gazed at the picture I found myself feeling sorry for the pup. She looked so distressed and pitiful. I reminded myself that in order to help this dog I was going to need to focus on her potential, not her past. As I glanced out the window I saw the van pulling into the parking lot. I gathered my belongings and headed out the door, ready to meet with our new little friend. “Yes.” I handed her the paperwork that had all of the information about the dog. She lookd over the papers, then pulled open the side door of the van. The van was filled with crates all stacked one on top of the other, each one holding a barking dog. It was nearly overwhelming. “Well, there she is!” the woman said, and pointed to a crate in the middle of the van. As I peered into the crate, the poor little girl was so petrified she sat huddled in the back like a tiny ball. As I opened the crate door and reached for her collar, I spoke reassuringly. “C’mon girl, it’ll be okay now. Let’s go,” I said as I coaxed her from the crate and secured the leash to her collar. Once out of the crate, she lay on the blacktop with her tail firmly tucked between her back legs. I’ll never forget the look of pure terror in her big dark eyes! I needed to get her home and settled. I was determined to show her a stable and loving environment. This entry was posted in The Moyer Menagerie and tagged border collies, dog behavior, dog training, dogs, dogs with cancer., family, medical problems in dogs, pets, rescue dogs. Bookmark the permalink. Pleased you like it, Pam. So cute. Hope everything works out. That read went way too fast! Looking forward to the next posting.